Early Hebrew Works on Chess. A game of skill, usually played by two persons, with sixteen pieces each, on a board divided into sixty-four squares alternately light and dark. Authoritative opinions agree that chess, under the Sanskrit name of "chaturanga" (= the four "angas" or members of an army), was known earliest to the Hindus—possibly as early as the sixth century of the present era. From India the game was carried into Persia, its name being changed into "shatranj." Mas'udi (947) speaks of chess as an Indian invention sent by an Indian king to Chosroes, King of Persia (531-579), the sixteen pieces of one side being of emerald, and those of the other being of ruby. From Persia the game passed into Arabia, and thence to central and western Europe; but how or when has not been determined. When the Jews first became acquainted with chess is not known. It has been supposed that the game was referred to in the Talmud; but the consensus of opinion now seems to be that certain games mentioned therein, which some have identified with chess, were not chess at all, but were played with dice, under the designations or , which Rashi ('Er. 61a) interprets as "chess." Nathan ben Jehiel of Rome (1103), however, in his "'Aruk," distinctly translates the word , supposed by some to indicate chess, by the Arabic "al-nard," which he renders by the Italian "dadi" (= dice). is clearly derived from the Greek ψῆφος, and refers to some game with pebbles or dice (Yer. R. H. i. 57c). The matter has been fully discussed by Franz Delitzsch ("Ueber das Schach und die Damit Verwandten Spiele in den Talmuden," in "Orient, Lit." Jan., 1840, pp. 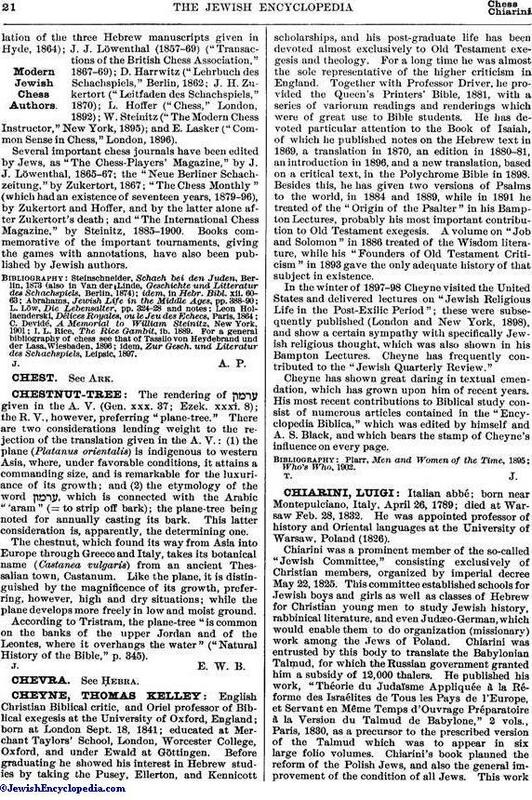 42-53), who concludes that, as the Talmud was completed in the fifth century, chess could not have been referred to therein, inasmuch as the Persians, from whom the Jews would have learned the game, did not know it themselves until the close of that century (see also L. Löw, "Lebensalter," p. 324). Eminent Jewish Chess Masters. 1. Alexandre. 2. Horwitz. 3. Löwenthal. 4. Kolisch. 5. Gunsberg. 6. Janowski. 7.Lasker. 8. Tarrasch. 9 and 10. Zuckertort and Steinitz, playing their match at New York, 1886. Steinschneider ("Schach bei den Juden," p. 33) conjectures that the first Jew to recommend chess was the convert Ali, son of "Rabbi" Saul of Taberistan, teacher of the physician Razi (ninth century), who considered the game a remedy for low spirits and dejected mental condition. By the eleventh century it was commonly played in Spain. After Rashi, the first European to mention chess was Moses Sephardi, born in Spain in 1062 and baptized at the age of forty-four as Petrus Alfonsi, who in his "Disciplina Clericalis" includes chess in the seven accomplishments ("probitates") of a knight. In Italy it was known at the same period, having been probably derived from the East through Byzantium. In the twelfth century chess had spread to France, Germany, and England, and by 1200 had become a favorite gambling game throughout Europe; to such an extent, indeed, that it was prohibited by the Council of Paris, 1212, and afterward by Louịs IX. At the same epoch the "Sefer Ḥasidim" (Book of the Pious), § 400, strongly recommended the game. Nothwithstanding the clerical prohibition, there is a legend to the effect that the pope himself played chess with a Jew: it occurs in "Das Leben Elchanans oder Elchonons," pp. 27, 46, Frankfort-on-the-Main, 1753: "This pope is the best one they ever had, since he can not get along without Jews, with whom he plays chess. . . . Rabbi Simeon is a great master of chess; but the pope mates him." The pope is even recognized by R. Simeon as his son through a particular move which he had taught him. This Simeon seems to have been Simeon ha-Gadol, who lived at Mayence about the beginning of the eleventh century. See Andreas. I will sing a song of battle Planned in days long passed and over. Men of skill and science set it On a plain of eight divisions, And designed in squares all chequered. Two camps face each one the other, And the kings stand by for battle, And 'twixt these two is the fighting. Bent on war the face of each is, Ever moving or encamping, Yet no swords are drawn in warfare, For a war of thoughts their war is. They are known by signs and tokens Sealed and written on their bodies; And a man who sees them, thinketh Edomites and Ethiopians Are these two that fight together. And the Ethiopian forces Overspread the field of battle, And the Edomites pursue them. First in battle the foot-soldier Comes to fight upon the highway, Ever marching straight before him, But to capture moving sideways, Straying not from off his pathway, Neither do his steps go backward; He may leap at the beginning Anywhere within three chequers. Should he take his steps in battle Far away unto the eighth row, Then a Queen to all appearance He becomes and fights as she does. And the Queen directs her moving As she will to any quarter. Backs the Elephant or advances, Stands aside as 'twere an ambush; As the Queen's way, so is his way, But o'er him she hath advantage; He stands only in the third rank. Swift the Horse is in the battle, Moving on a crooked pathway; Ways of his are ever crooked; 'Mid the Squares, three form his limit. Straight the Wind moves o'er the war-path In the field across or lengthwise; Ways of crookedness he seeks not, But straight paths without perverseness. Turning every way the King goes, Giving aid unto his subjects; In his actions he is cautious, Whether fighting or encamping. If his foe come to dismay him, From his place he flees in terror, Or the Wind can give him refuge. Sometimes he must flee before him; Multitudes at times support him; And all slaughter each other, Wasting with great wrath each other. Mighty men of both the sovereigns Slaughtered fall, with yet no bloodshed. Ethiopia sometimes triumphs, Edom flees away before her; Now victorious is Edom: Ethiopia and her sovereign Are defeated in the battle. Should a King in the destruction Fall within the foeman's power, He is never granted mercy, Neither refuge nor deliv'rance, Nor a flight to refuge-city. Judged by foes, and lacking rescue, Though not slain he is checkmated. Hosts about him all are slaughtered, Giving life for his deliverance. Quenched and vanished is their glory, For they see their lord is smitten; Yet they fight again this battle, For in death is resurrection. It is characteristic of this poem that the pawn moves two spaces at the first move, as at present, but not as in the Arabic game. The queening of a pawn is also mentioned. The queen may move in all directions, but only one space, like the king at present. The bishop "fil" or (elephant) moves diagonally, but only three spaces. Castling is unknown. The "wind" is the rook. Steinschneider declares on subjective grounds, against the attribution to Ibn Ezra, and is supported by the like opinion of Dr. Egers, the editor of Ibn Ezra's poetry. King, , moves one in any direction. Queen, , to the right of the king, moves two or three spaces in any direction. Knights, or (="horsemen" or horses"), move one space obliquely and one space straight forward. Bishops, (= elephants; editio princeps = "camps "), move obliquely to the third space. Rooks, move straight, forward, backward, or from side to side. Pawns, ("heroes"), move straight forward. The chief characteristic of Bonsenior's work is the large number of Biblical texts which he employs. King, (Persian "shah"), may castle. Queen, ("ferzân" or "parzan"), occupies at the beginning of game a space of its own color. Pawn, , foot-soldier, moves two boxes at the first move, and may become a queen. A number of other early works on chess will be found in Steinschneider's "Schach bei den Juden" (pp. 22-33). 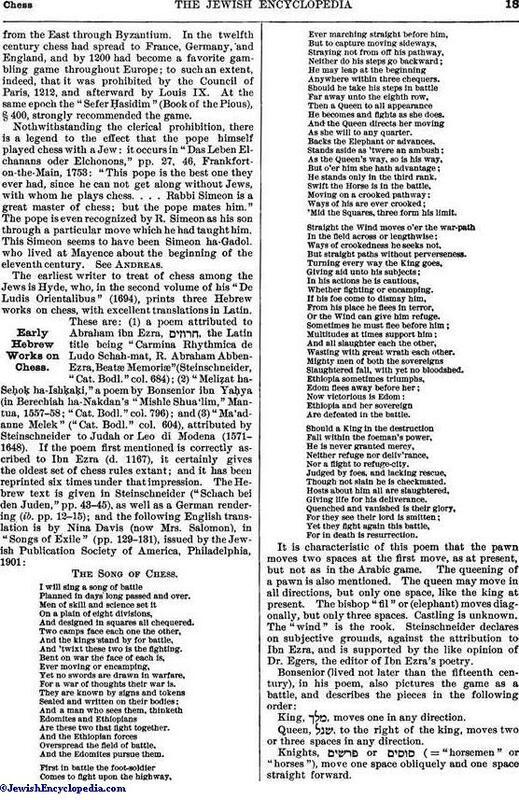 Among these may be specially mentioned a Catalan poem by Moses Azan, translated into Castilian in 1350; a poem of 1532, which describes castling as an interchange of places between king and rook; and "Ha-Ḳerab" (The War), a poem in Hebrew, composed by Jacob Eichenbaum in Odessa, and printed in London (n. d.; dedication dated Sept. 3, 1839). It has been translated into Russian by Joseph Ossip Rabbinovicz. "A country without earth: kings and princes walking without soul. If the king be wasted, all is without soul." Chess is referred to by Maimonides (1155-1204), who mentions a forced mate and declares professional chess-players as unworthy of credence in the law courts (commentary on Mishnah Sanh. ii. 3), and by Kalonymus ben Kalonymus (c. 1300). The former condemns the game only when played for money; the latter, whether played for stakes or not. During the thirteenth and the four following centuries chess was quite commonly played; and Jewish literature contains numerous rabbinical opinions for and against it. Strangely enough, Joseph Caro does not refer to it in his great code, the Shulḥan 'Aruk. Moses Isserles (d. 1573) terms it "the game with bones called chess," and approves of its being played not only on weekdays, but on the Sabbath, though not for money. An old responsum (Dukes, in "Ben Chananja," 1864, pp. 601, 650) states that in Spain the game of chess ( [? ]) was sanctioned by the Rabbis. After a visitation of the plague in 1575 the three rabbis of Cremona declared that with the exception of chess ("ishḳaḳi") all games were "primary evils and the cause of all troubles "(Lampronti, "Paḥad Yiẓḥaḳ," iii. 54). Schudt ("Jüdische Merckwürdigkeiten," pt. VI., ch. xxxv., p. 317) records that in Frankfort-on-the-Main, after the great fire of 1711, the Jewish community passed a resolution forbidding for a period of fourteen years any Jew or Jewess (except sick persons and lying-in women) to play chess. When played on the Sabbath, it became customary in Germany, in honor of the day, to use chessmen made of silver ("Shilṭe ha-Gibborim," on 'Er. 127b), though wooden pieces were not disallowed. Chess was popular among Jewesses, as is seen from Schudt's remark (l.c. IV. ii. 381) that "it is not at all strange that Jews should play chess well, since Jewish women have for many years played and practised the game." In 1617 a Jewess of Venice became well known for her skill in chess. Indeed, Abrahams ("Jewish Life in the Middle Ages," p. 388) goes so far as to suggest that it first made its way among Jewish circles as a woman's game. R. Aaron Sason of Constantinople recommends the avoidance of chess on Sabbath (Responsa, No. 180). Elijah de Vidas appears to have been the sole halakist who absolutely forbade the game ("Shebeṭ Musar," 1712, ch. xlii.). Children under fourteen were allowed to learn the game, on the ground that it rendered the intellect more acute. Elijah Cohen of Smyrna ("Shebeṭ Musar," l.c.) objects to chess on the ground that it wastes time and takes the mind away from study. Azulai (1774) agrees with Ali ben Saul, mentioned above, in favoring chess only as a remedy for illness or melancholy. He also cites opinions for and against playing chess on Saturdays (Berliner," Aus dem Inneren Leben der Deutschen Juden im Mittelalter," pp. 12, 53, Berlin, 1871). Mendelssohn was a passionate lover of the game, and is said to have cemented his friendship with Lessing over the chessboard. Yet he is credited with the dictum: "Chess is too earnest for a game; too much of a game to be in earnest about it" ("Für Spiel ist es zu viel Ernst, für Ernst zu viel Spiel"; compare Dukes, in "Ben Chananja," 1864, vii. 636; something similar is attributed to Montaigne). From the eighteenth century (to which belongs Albert [Aaron] Alexandre) onward, Jews came more and more to the front as chess-players; and it is not too much to say that in recent years they have proved themselves paramount as exponents of the game both in Europe and in America. As a race they seem to possess those intellectual qualities which are necessary to excel in chess. It must suffice here merely to mention a few names, such as S. Alapin, O. Blumenthal, W. Cohn, E. Delmar, L. R. Eisenberg, B. Englisch, E. Epstein, I. Gunsberg, D. Harrwitz, Leopold Hoffer, B. Horwitz, Herbert Jacobs, D. Janowski, Baron Ignaz von Kolisch, J. J. Löwenthal, S. Lipschütz, S. Rosenthal, E. Schiffers, Carl Schlechter, S. Tarrasch, Max Weiss, and S. Winawer. 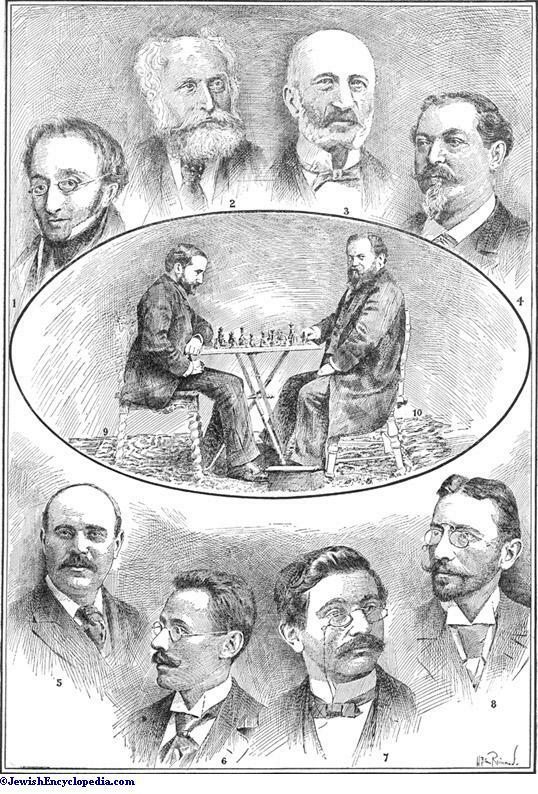 Besides these, three Jewish chess masters stand out with especial prominence as having held the primacy of the chess world since 1866; viz., J. H. Zukertort, William Steinitz, and Emanuel Lasker. Johannes H. Zukertort (1842-88) was a pupil ofthe celebrated player A. Anderssen, whom he at length defeated in 1871 with a score of 5 to 2. In 1878 he gained the first prize at the international tournament at Paris, and in 1883 took the same position at the great London tournament, in which all the greatest chess masters of the day (except Paulsen) competed. Zukertort excelled as a blindfold player. In 1876 he played thus against 16 strong amateurs, the result being: won 12, lost 1, drew 3. William Steinitz (1836-1900) held the chess championship of the world for a period of twenty-eight years (1866-1894), and during that time may be said to have formed a new school of chess. In place of the fierce attack, he sought to win by a combination of minor advantages; and his method was gradually adopted by the leading experts. The Steinitz gambit (see below), though now generally discarded, had for a time a considerable number of adherents. Emanuel Lasker (b. 1868) is the present champion of the world (1902), having succeeded in wresting that title from Steinitz in 1894. In 1896 he was first in the Nuremberg tourney; in 1899, first in the London tournament; and again first in that at the Paris Exposition of 1900. 1851, London: Anderssen 1; Horwitz 7. 1857, Manchester: Löwenthal 1; Anderssen 2. 1858, Birmingham: Löwenthal 1; Falkbeer 2. 1860, Cambridge: Kolisch 1; Stanley 2. 1862, London: Anderssen, 1; Steinitz 6. 1865, Dublin: Steinitz 1; MacDonnell 2. 1866, British Chess Association: Steinitz 1; Green 2. 1867, Paris: Kolisch 1; Winawer 2; Steinitz 3. 1867, Dundee: Neumann1; Steinitz 2; De Vere 3. 1868, British Chess Association Handicap: Steinitz 1; Wisker 2; Blackburne 3. 1870, Baden-Baden: Anderssen 1; Steinitz 2; Blackburne 3. 1872, London: Steinitz 1; Blackburne 2; Zukertort 3. 1873, Vienna: Steinitz 1; Blackburne 2; Anderssen 3; Rosenthal 4. 1876, London: Blackburne 1; Zukertort 2. 1878, Paris: Zukertort 1; Winawer 2. 1881, Berlin: Blackburne 1; Zukertort 2; Tehigorin 3. 1882, Vienna: Steinitz and Winawer 1 and 2; Zukertort 5. 1883, London: Zukertort 1; Steinitz 2. 1883, Nuremberg: Winawer 1. Blackburne 2. 1885, Hamburg: Gunsberg 1; Englisch, Tarrasch, Weiss (tied) 2. 1886, London: Gunsberg and Taubenhaus 3 and 4. 1886, Nottingham: Gunsberg and Zukertort 3 and 4. 1887, Frankfort: Blackburne and Weiss 2 and 3; Bardeleben 4; Tarrasch 5. 1888, Bradford: Gunsberg 1; Mackenzie 2. 1889, New York: Tchigorin and Weiss 1 and 2; Gunsberg 3. 1889, Breslau: Tarrasch 1; Burn 2; Weiss 3; Gunsberg 4. 1890, Amsterdam: Burn1; Lasker 2; Mason 3. 1890, Manchester: Tarrasch 1; Blackburne 2. 1891, Dresden: Tarrasch 1; Markovetz 2. Porges 3. 1894, Leipsic: Tarrasch 1; Lipke and Teichman 2 and 3. 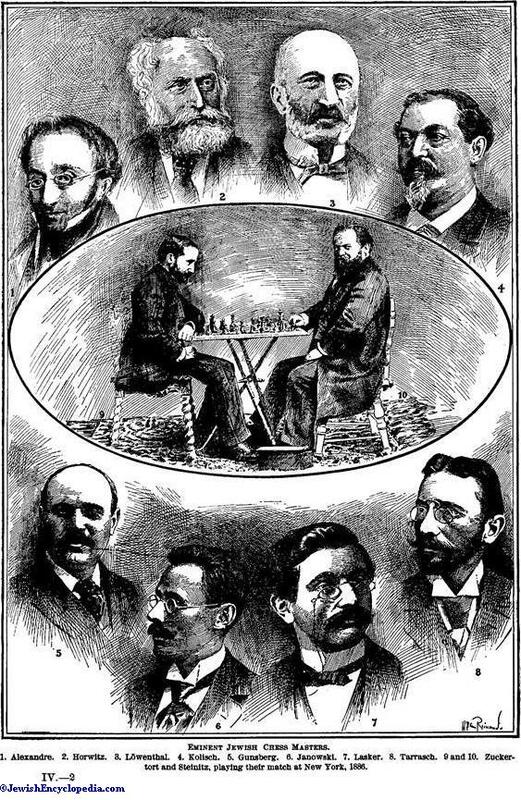 1895, Hastings: Pillsbury 1; Tchigorin 2; Lasker 3; Tarrasch 4; Steinitz 5. 1896, Nuremberg: Lasker 1; Maroczy 2; Tarrasch 3. 1896, Budapest: Tchigorin 1; Charousek 2; Pillsbury 3. 1898, Vienna: Tarrasch 1: Pillsbury 2. 1898, Cologne: Burn 1; Charousek 2; Cohn 3. 1899, London: Lasker 1; Janowski, Maroczy, and Pillsbury tied for 2, 3, and 4. 1900, Munich: Maroczy, Pillsbury, and Schlechter tied for 1, 2 and 3. 1900, Paris: Lasker 1; Pillsbury 2. 1901, Monte Cario: Janowski 1; Schelechter 2. 1902, Hanover: Janowski 1; Pillsbury 2. Of 33 important matches since 1834, enumerated in the "Encyc. Brit." Supplement, 1902, s.v. 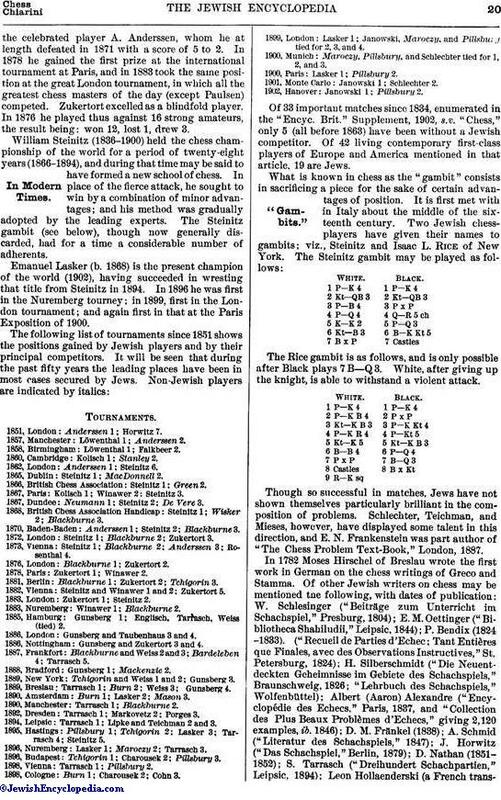 "Chess," only 5 (all before 1863) have been without a Jewish competitor. Of 42 living contemporary first-class players of Europe and America mentioned in that article, 19 are Jews. The Rice gambit is as follows, and is only possible after Black plays 7B—Q3. White, after giving up the knight, is able to withstand a violent attack. Though so successful in matches, Jews have not shown themselves particularly brilliant in the composition of problems. Schlechter, Teichman, and Mieses, however, have displayed some talent in this direction, and E. N. Frankenstein was part author of "The Chess Problem Text-Book," London, 1887. In 1782 Moses Hirschel of Breslau wrote the first work in German on the chess writings of Greco and Stamma. 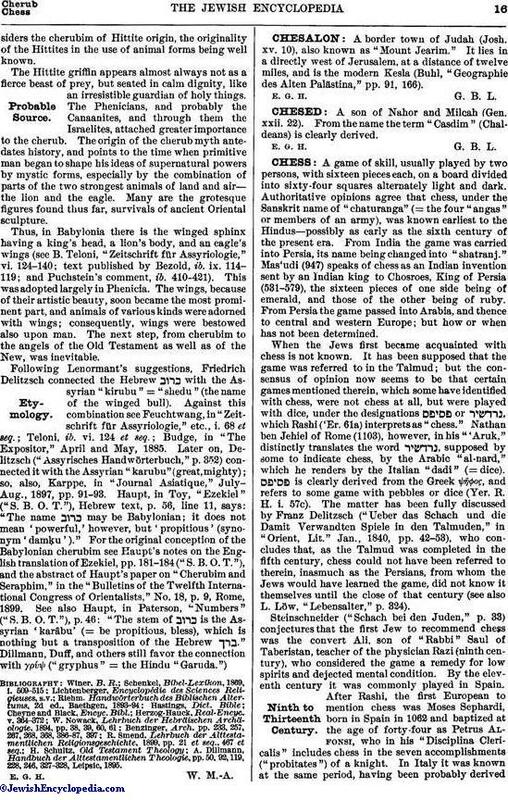 Of other Jewish writers on chess may be mentioned the following, with dates of publication: W. Schlesinger ("Beiträge zum Unterricht im Schachspiel," Presburg, 1804); E. M. Oettinger ("Bibliotheca Shahiludii," Leipsic, 1844); P. Bendix (1824 -1833). ("Recueil de Parties d'Echec; Tant Entières que Finales, avec des Observations Instructives," St. Petersburg, 1824); H. Silberschmidt ("Die Neuentdeckten Geheimnisse im Gebiete des Schachspiels", Braunschweig, 1826; "Lehrbuch des Schachspiels," Wolfeubüttel); Albert (Aaron) Alexandre ("Encyclopédie des Echecs," Paris, 1837, and "Collection des Plus Beaux Problèmes d'Echecs," giving 2,120 examples, ib. 1846); D. M. Fränkel (1838); A. Schmid ("Literatur des Schachspiels," 1847); J. Horwitz ("Das Schachspiel," Berlin, 1879); D. Nathan (1851-1852); S. Tarrasch ("Dreihundert Schachpartien," Leipsic, 1894); Leon Hollaenderski (a French translationof the three Hebrew manuscripts given in Hyde, 1864); J. J. Löwenthal (1857-69) ("Transactions of the British Chess Association," 1867-69); D. Harrwitz ("Lehrbuch des Schachspiels," Berlin, 1862; J. H. Zukertort ("Leitfaden des Schachspiels," 1870); L. Hoffer ("Chess," London, 1892); W. Steinitz ("The Modern Chess Instructor," New York, 1895); and E. Lasker ("Common Sense in Chess," London, 1896). 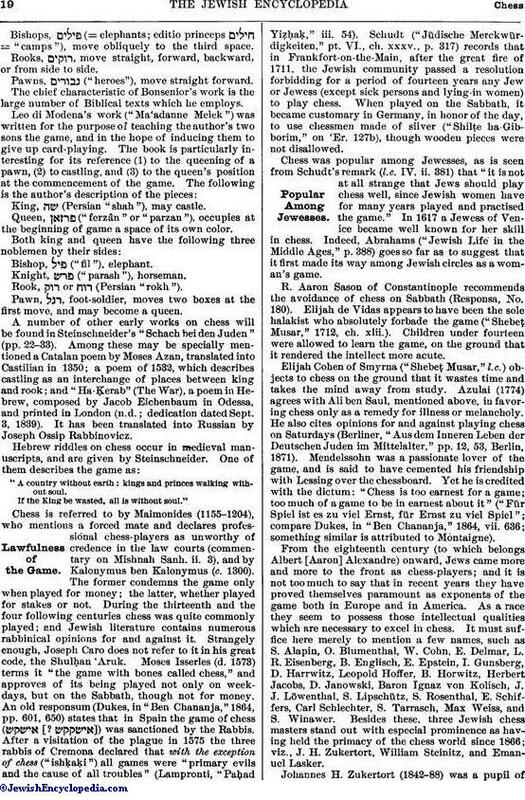 Several important chess journals have been edited by Jews, as "The Chess-Players' Magazine," by J. J. Löwenthal, 1865-67; the "Neue Berliner Schachzeitung," by Zukertort, 1867; "The Chess Monthly" (which had an existence of seventeen years, 1879-96), by Zukertort and Hoffer, and by the latter alone after Zukertort's death; and "The International Chess Magazine," by Steinitz, 1885-1900. Books commemorative of the important tournaments, giving the games-with annotations, have also been published by Jewish authors. I. L. Rice, The Rice Gambit, ib. 1889.
idem, Zur Gesch. und Literatur des Schachspiels, Leipsic, 1897.